Accountability is a dirty word. It evokes images of finger wagging, stern looks, and sheepish floor staring. I'm sure at one point of the word's evolution it wasn't this way. Words and phrases earn their reputation by those that use and receive them. In banking, it is what we made it to be. On a recent Pennsylvania Institute of CPA podcast, Bob Kafafian from my firm was asked how to use management information. Bob's response resulted in a follow-up question by a Midwest banker friend of mine. And since I am scheduled to speak about it at a Financial Managers Society breakfast tomorrow, I'll answer it. Here are my ideas on how to use Management Information to create a positive accountability culture. 1. Hold branch managers accountable for revenue growth. 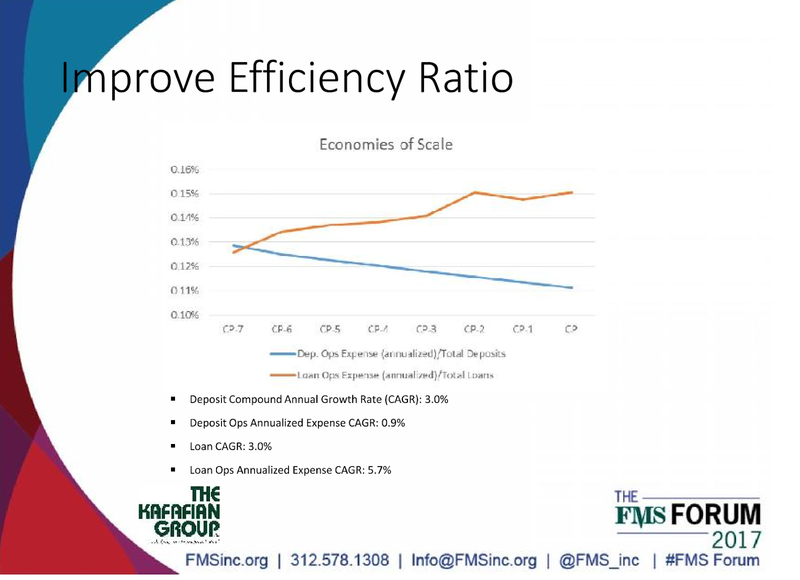 Revenue growth equals deposit spread (coterminous using funds transfer pricing, or FTP), loan spread less provision (for loans that the branch is responsible for generating), and fee income. Imagine if Wells Fargo branch managers were accountable for this, instead of number of accounts per customer. Fake accounts with little or no balance generate little or no spread. But draws operating expenses from support centers. Imagine if your branch managers were accountable for this instead of deposit dollar growth. Would you be getting that desperate phone call asking for a rate exception to keep the money at the bank? 2. Hold lenders accountable for their portfolio ROE. You read it right. That's an "E", not an "A". Lending is a risk business, and aside from the provision expense, and net-charge off rate, those loans require equity to support them. 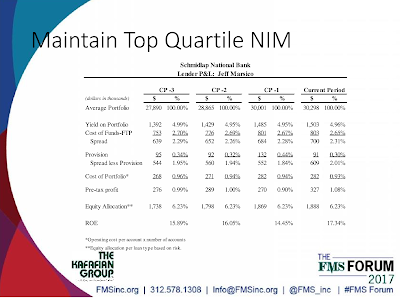 If you allocate equity by product based on your institution's risk experience, then you know how much equity your institution requires. It should be part of your capital plan. Drill that down to the loan level, you can create ROE hurdles when lenders price loans, and measure their pre-tax ROE on their entire portfolio using the coterminous spread, less provision expense, less operating expense per loan type, to calculate the lenders' actual ROE for their portfolio. Imagine! percent of deposit balances should decline long-term in a growing institution. It is the very definition of economies of scale. Notice I say long-term, because you don't want to defer investment in personnel or technology in fear of causing an upward blip in your trend. That's managing by budget that has caused executives to reduce innovation so they can make their budget. 4. Rank. Nothing should be more motivating than ranking branches, lenders, and support managers in achieving their goals as measured by Management Information than seeing where they rank among their peers. Including a ranking report of your twenty branches by revenue growth, and profitability, in a sales meeting should put smiles on the faces of those at the top, and a look of determination on the faces of those wanting to get there. 5. Reward. Incentivize your personnel for achievement. Let's turn that frown upside down when we talk of accountability. Deposit Operations costing 16 basis points of deposits three years ago, and 12 basis points today, is an achievement that should be recognized by the entire institution. The same for ROE improvement for lenders, or pre-tax profit improvement by branch managers. Let's not foster a culture of fear, recrimination, and public floggings. Let's raise up our achievers! I frequently speak of financial institutions' over-investment in under performing branches. Those investments of our precious operating expense dollars could be used in more promising areas. Instead, we limit resources to the very things that could lead us to a more sustainable future. Using profitability information to incentivize the right behavior will create a culture of achievement, and help us make more efficient decisions to better serve customers, reward employees, and improve performance. How do you use Management Information to run your bank? 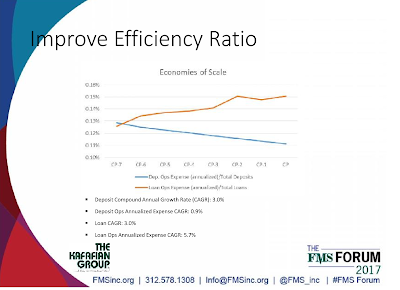 My firm, The Kafafian Group, does profitability reporting on an outsourced basis because we recognize the challenge community financial institutions face in building their own model, and running it quarter after quarter. If interested, call Gregg Wagner, our practice leader, at 973-299-0200 x114 or reach him at gwagner@kafafiangroup.com. Jeff -- The five items listed are great. I'll offer up a little bit of reinforcement on #4 Rank. I like the fact you look at both profit and revenue growth. I view each unit as a "stock" in a mutual fund, with the managers and individuals making investments into loans, deposits and non-interest income products, on behalf of the shareholders. The most profitable units are the ones that maintain the value of the bank, while the ones growing profit (revenue) are the ones who are increasing the value of the bank. Both are equally important, but too often, the least profitable, but fastest growing units are under-recognized. Perhaps consider a mix of metrics. Only a few, and easy to understand by those held accountable. Such as revenue and profit trends, on an absolute basis, and a relative basis. A successful business should include a mix of growth areas, and slow growth cash cow areas. Both are valuable. Not the profit laggards with little growth potential.